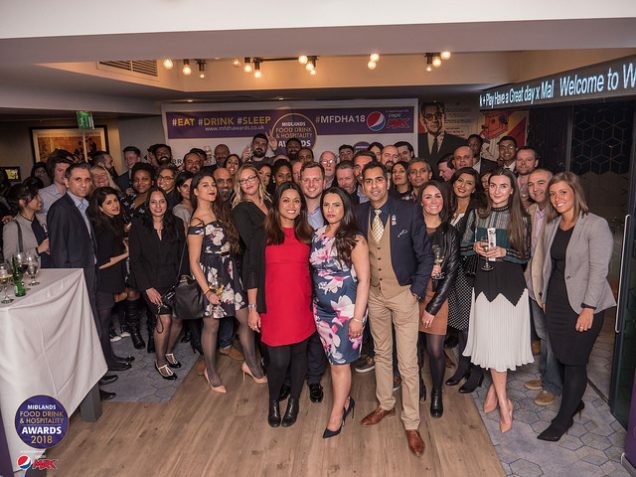 Last night the Midlands Food Drink & Hospitality Awards officially kicked off with a bang, the launch party which was hosted by Malmaison saw people from the industry shimmering & mingling. The excitement and buzz in the room was amplified by the audacious host Raaj Shamji. Now in it’s 3rd Year the aim of the MFDH Awards is to recognise and reward the very best of the restaurants, bars, pubs, cafes, hotels and everything in-between for their outstanding contribution to the industry. Like the awards themselves, the launch brought together people from all around Birmingham and other cities throughout the Midlands. It gave everyone the chance to network and meet the MFDH Awards organisers, sponsors and judges as well as fellow nominees and more. The launch included a speech given by Raaj Shamji on behalf of the organisers and partners,. There were delicious canapes served on the night, with photographer Edwin Ladd on scene taking pictures capturing the atmosphere in the room. Organiser & Co-Founder Anita Chumber said, “It’s overwhelming the amount of support that we’ve had from conception, with such a good turn out especially on a Monday evening. We’d like to give a big thank you to our headline sponsors Pepsi Max, our diamond sponsors NFU Mutual, Evolve Recruitment & Swallow drinks and our other supporting sponsors Britvic, Pathway Group, Three Church Road, NA Consulting, Midlands Retail Forum, Simply Mahirs & VU Ads. We are pleased to be supporting for the second year Midlands Air Ambulance as our Charity Partner. The food industry is one of the toughest in the world but also one of the most lucrative, inviting business, trade and investment so it’s only fitting that they’re properly rewarded for their efforts. If there’s someone out there in the Midlands that you believe deserves an esteemed MFDH award, then don’t forget to get your nominations in before the deadline, April 28th. The categories are available on our website www.mfdhawards.co.uk where you can also find more information on the awards! If you’d like to see the images from the night, check out these links below!